Winter came in the night, like a white sheet laid over the world. It came so cold and so fast that the waves of the ocean froze as they rolled. The good ship Lucky Star froze with them, trapped tight in the suddenly solid sea. The Race to the Top of the World! It comes around once in a lifetime, and the prize? Your heart's desire. Shen and Sika can't resist the chance to win, but competition is fierce. The path to victory is littered with snow trolls, sea monsters, and a gang of particularly hungry yetis. But Shen and Sika have something the other contestants don't have. Actually, they have 66 other things; pugs to be exact. That's a 264 paw-powered sled. Let the race begin! This book is delightfully bizarre! 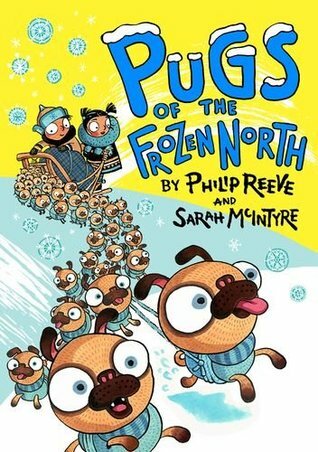 I'm completely convinced that sixty-four pugs could pull a sled in a race to meet the Snowfather. In fact, I would argue with anyone that doubted it. From the moment the sea freezes over, I was wrapped up in this story. All the characters are quirky and unique. How could you not love Mitzi Von Primm with her newly grown Yeti fur or Helga Hammerfest and her beard? The story is mind blowingly original. The Yeti Noodle Bar was the zaniest part of the book and yet so utterly believable. Sensitive situations were made extremely child friendly and I imagine children getting comfort from the way the story climaxes. I honestly don't know what I loved best - the illustrations or the words. They both work so beautifully together. I think someone should capture the imagination of Reeve and McIntyre and bottle it. It would sell for a thousands on Ebay. When I'm plotting in the future, I shall ponder over the question - what would Reeve and McIntyre do in this situation? I can see why these books are such a hit with the kids. They take situations further than extreme and make them down right hilarious. I would say it would suit the more confident reader but it would also be a brilliant book for parents and children to share together. What a super talented team.